Our 1-day Great Wall hiking programs is our bread and butter and is what made us famous. With our 1-day programs you can see the best of the Great Wall in style and comfort, and which will also allow you to be back in Beijing by nightfall. Except for snow and inclement weather, these programs are available all year round. With these programs you can see the most famous sections of the Great Wall, the ones that you have probably scene on postcards, National geographic, and the like. You can venture across the dramatic ruins of Jiankou, walk through the graceful watchtowers of Mutianyu, visit the relatively tourist-free sections of Huanghuacheng and Xishuiyu, or take the challenge of our most popular Great Wall trip, the hike between Gubeikou and Jinshanling, which gives you the full Great Wall experience, from tastefully restored watchtowers and brick to the spectacular real “Great Wall” in its unrestored splendor. Your travel guides are fully licensed to provide stimulating and thoughtful tours for hikers to the Great Wall, and are with you throughout your trip, explaining the legends behind the wall, from sections used to resist the Mongols to those that repelled the Japanese, allowing you to have a fun, informative, and safe trip. 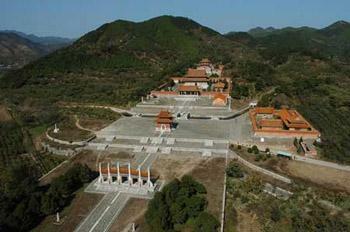 In addition to spending time on one one the best sections of the Great Wall, you'll also get to explore the Eastern Qing Tombs, which is the final resting place for many of China's last ruling dynasty. The day starts with a drive out to the Great Wall at Huangyaguan. The great thing about Huangyaguan was that it was designed as a miniature version of the entire Great Wall, giving you an understanding of the Great Wall's functions and features without having to walk the whole thing! From there we'll drive to the Eastern Qing tombs, a sprawling tomb complex that many feel is much more exciting than the Ming Tombs. Here is the final resting place of five emperors, four empresses, five imperial concubines, and one princess of China's last imperial dynasty, the Qing.